How cute are these toddlers picnic tables and benches? These beautiful white picnic tables will be a perfect addition to your stylish party! Each picnic table comes with 2 bench seats (seats approx. 6 toddlers per table). We have 2 picnic tables and 4 bench seats available which will fit 12 toddlers (aged 18 months - 6 years old). Hosting a first birthday and need ideas to keep the older toddlers busy? 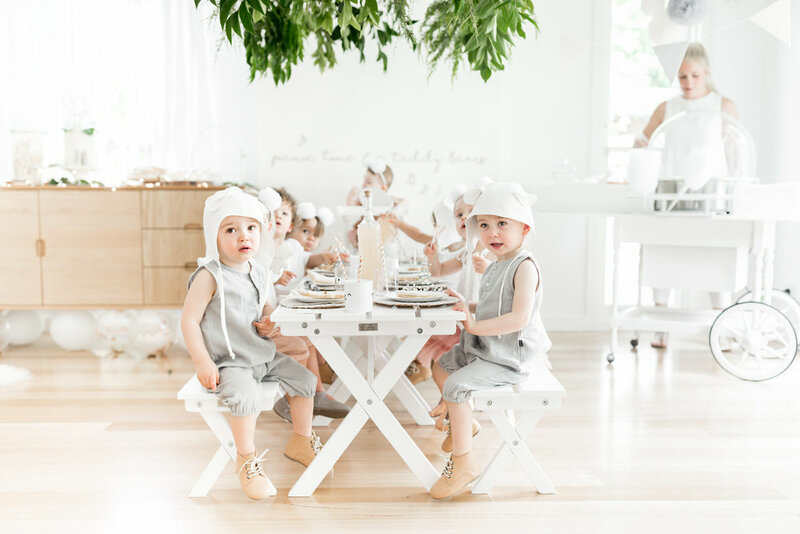 Our SIT AND PLAY package includes not only the picnic tables that can be used for eating, but even better when it turns into the cutest activity table after mealtime! The activity pack comes with 2 x White Olli Ella Baskets filled with 4 wooden rolling pins and 4 play dough stampers. It also includes 4 x wipeable play dough mats (in white, dusty rose or grey) that the kids can roll and create their own little play dough figurines during the party. We have had so much love for our picnic benches that we had to release a new range of low picnic tables, the perfect height for not just kids parties but also adult birthdays, baby showers & bridal showers. These stylish low white table can be adapted to any style of parties- rustic, boho, dreamy, colourful- you name it! These picnic tables can be hired alone or along with rattans & cushions as an entire package. Additional 2 x Jute Rugs available for hire for $15 in total. *Cushions available in white & dusty pink combo or white & minty blue combo. Swipe right for photos of cushions. ** Suitable for both INDOORS and OUTDOORS party. Jute Rugs will be needed if used for outdoor party.